James Beard Award-winning and self-made chef Naomi Pomeroy's debut cookbook, featuring nearly 140 lesson-driven recipes designed to improve the home cook's understanding of professional techniques and flavor combinations in order to produce simple, but show-stopping meals. Naomi Pomeroy knows that the best recipes are the ones that make you a better cook. A twenty-year veteran chef with four restaurants to her name, she learned her trade not in fancy culinary schools but by reading cookbooks. From Madeleine Kamman and Charlie Trotter to Alice Waters and Gray Kunz, Naomi cooked her way through the classics, studying French technique, learning how to shop for produce, and mastering balance, acidity, and seasoning. 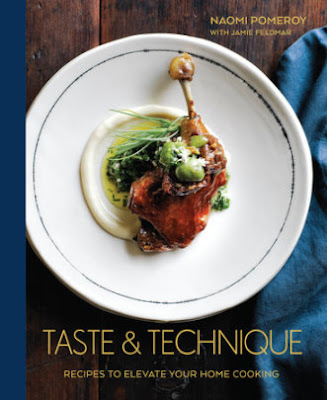 In Taste & Technique, Naomi shares her hard-won knowledge, passion, and experience along with nearly 140 recipes that outline the fundamentals of cooking. By paring back complex dishes to the building-block techniques used to create them, Naomi takes you through each recipe step by step, distilling detailed culinary information to reveal the simple methods chefs use to get professional results. Recipes for sauces, starters, salads, vegetables, and desserts can be mixed and matched with poultry, beef, lamb, seafood, and egg dishes to create show-stopping meals all year round. Practice braising and searing with a Milk-Braised Pork Shoulder, then pair it with Orange-Caraway Glazed Carrots in the springtime or Caramelized Delicata Squash in the winter. Prepare an impressive Herbed Leg of Lamb for a holiday gathering, and accompany it with Spring Pea Risotto or Blistered Cauliflower with Anchovy, Garlic, and Chile Flakes. With detailed sections on ingredients, equipment, and techniques, this inspiring, beautifully photographed guide demystifies the hows and whys of cooking and gives you the confidence and know-how to become a masterful cook. Taste & Technique: Recipes to Elevate Your Home Cooking” is a large(quite heavy) book of recipes and the photos are gorgeous and full of color. Being in Culinary school, I am always looking to better myself in the cooking department. I'm originally from SW Louisiana...so I know how to cook tons of different food. This book will be a wonderful addition to our cookbook collection! The book has recipes in this book will show you how to better your; sauces, starters, soups, salads, veggies, eggs, seafood, poultry, pork, beef, lamb, desserts & pastry.